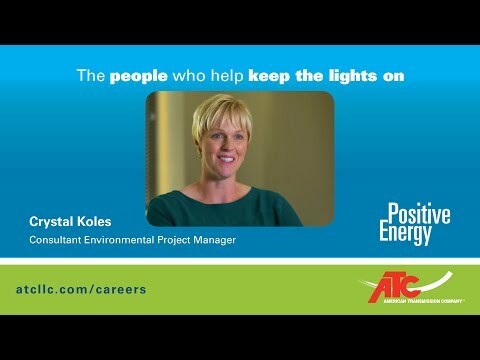 The people who help keep the lights on: Crystal Koles, Consultant Environmental Project Manager | American Transmission Co. Consultant Environmental Project Manager Crystal Koles says she was initially drawn to American Transmission Co. because the company’s values align with her own. “ATC has a very strong environmental commitment. That was important to me. I needed to work for a company that really did what they said they were going to do in terms of environmental protection,” Koles said. After more than 10 years with ATC, she says she’s proud to work for a company that cares. In her role, Koles helps ATC protect the environment as ATC plans, builds and maintains the electric transmission grid. She spends time in the field to ensure that compatible plants are growing and the environment is healthy in ATC’s rights-of-way. In addition to environmental responsibility, community involvement is also very important to Koles. She volunteers regularly with Service League of Green Bay to help children in need. Koles says her success at ATC is derived, in part, from the flexibility offered for community and family involvement. As for what’s next, Koles says she sees herself with ATC for the rest of her career. If you are interested in joining Koles and the rest of the ATC team, browse our open positions.